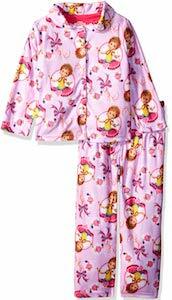 When it is bed time your child will love to be wearing this Fancy Nancy Pajama Set. The pajama has a long sleeve shirt and pants and both are pink and on the pink fabric you can find many images of Fancy Nancy but also other fun details like bows and perfume bottles. 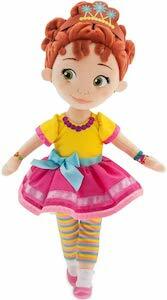 This kids sleepwear is available in sizes 2T – 10 and all are made from 100% polyester. Playing on a weekend morning or being warm in bed this pajama set is just perfect and I am sure that your child will love wearing this Fancy Nancy outfit.